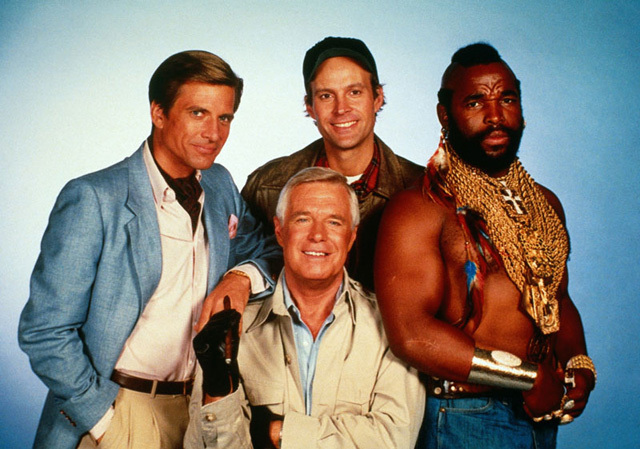 10 Things You Might Not Know About THE A-TEAM | Warped Factor - Words in the Key of Geek. Geek Dave ain't getting on no plane, fool! 1. In 1980 Mr. T (born Lawrence Tureaud) was spotted by Sylvester Stallone while he was taking part in NBC's "America's Toughest Bouncer" competition, a segment of NBC's Games People Play. Although his role in 1982's Rocky III was originally intended as just a few lines, Mr. T was eventually cast as Clubber Lang, the primary antagonist and one of the most memorable characters from the series. 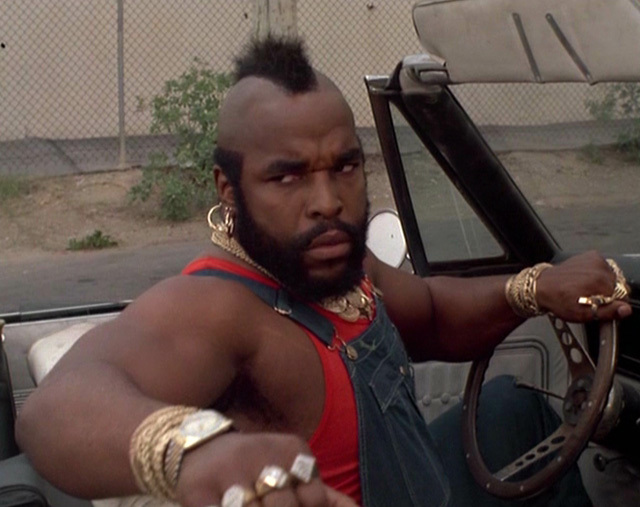 Shortly after the film's release NBC approached Mr. T with the intent to develop a series for him. 2. Stephen J. Cannell had already created several hit television series, including The Rockford Files, Baretta, and The Greatest American Hero, when then president of NBC Brandon Tartikoff approached him to develop a new series for the peacock network. Teamed with Frank Lupo, Tartikoff pitched the series to Cannell as a combination of The Dirty Dozen, Mission Impossible, The Magnificent Seven, Mad Max and Hill Street Blues, with "Mr. T driving the car". Their result was The A-Team. 3. Colonel John "Hannibal" Smith was based loosely on former United States Army Special Forces officer Bo Gritz. The producers originally had James Coburn in mind to play the part of Hannibal, but it eventually ended up going to George Peppard. The character was written as a master of disguise and aspiring actor, but the cigars came from Peppard himself. They were all real, and from his own private stock. 4. 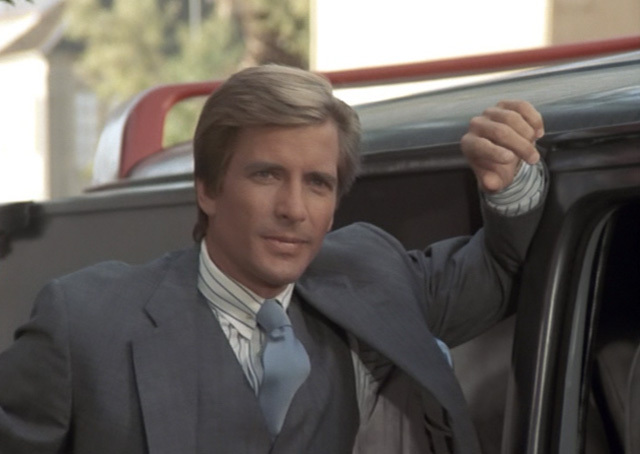 Although Cannell and Lupo had Dirk Benedict in mind for the role of Lieutenant Templeton Arthur Peck, aka The Faceman or simply Face, studio executives initially insisted that the role be handled differently; Tim Dunigan played the role in the pilot episode, but after it was completed, he was thought by the same executives to look too young to be a believable Vietnam veteran, and he was as Dunigan was in his sophomore year when the Vietnam war ended! Plus at 6'5" (198 cm) much taller than the rest of the cast. He was replaced by Benedict for the rest of the show's run. 5. 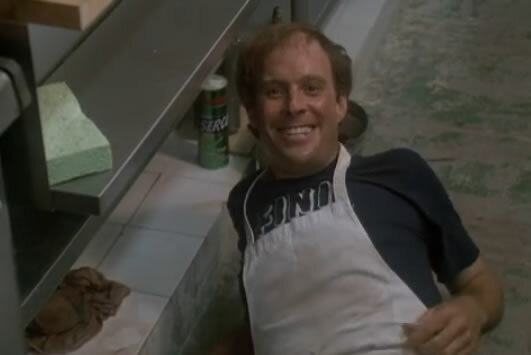 Dwight Schultz character, that of Captain H. M. "Howling Mad" Murdock, was almost written out of the series before it aired, as the producers found him to be too "over the top". 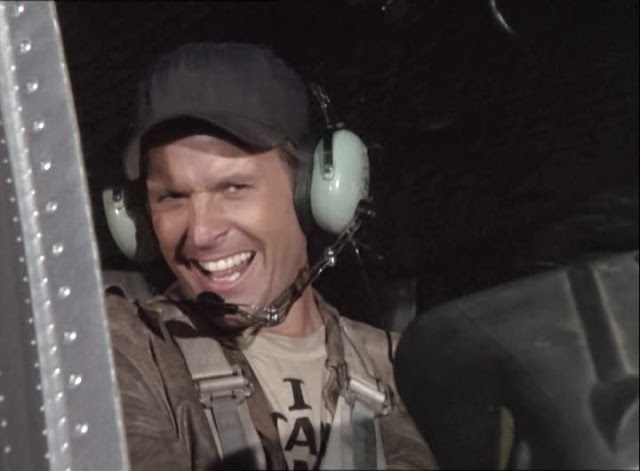 However, the popularity of the character among the test audience convinced the producers to keep the part of Murdock. 6. The character Sergeant Bosco Albert "B. A." (Bad Attitude) Baracus was especially written with Mr. T in mind and he quickly became the break-out star of The A-Team, something that didn't go down well with George Peppard who believed himself to be the star - Peppard was the most well known actor in the ensemble. Things got even worse when Peppard learned that Mr. T was paid more than he was. 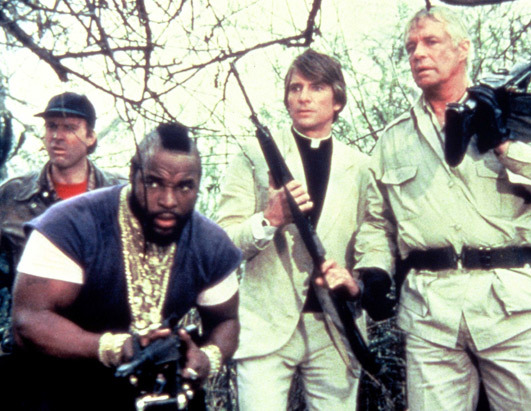 According to Dirk Benedict, George Peppard refused to talk to Mr. T and would use Benedict as a messenger between them. Peppard would only refer to Mr. T as "the man with the gold". Things got so bad that Benedict went on to say that Robert Vaughn was mainly added to the cast in the fifth season because he was a longtime friend of Peppard's and it was believed that he could ease the tensions between Peppard and Mr. T.
7. It wasn't only Mr. T that George Peppard seemed to take beef with. He was said to have resented the female actors that were added to the cast, Melinda Culea (Amy) and Marla Heasley (Tawnia), and told them so. Peppard felt that a female character was unnecessary for the show and continually protested their presence to producers. Ultimately, both actresses were fired and eventually the recurring female character was dropped. 8. It is a common error that B. A. 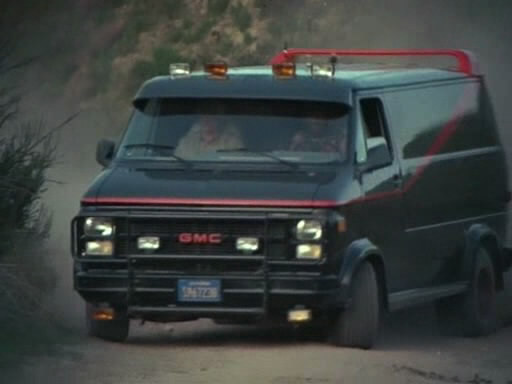 's iconic GMC Vandura van is said to be all-black, whereas, in fact, the section above the red stripe is metallic gray (this error even followed through on to most toy models of the van). 9. That iconic opening narration came courtesy of The A-Team producer John Ashley, who remained uncredited for his voiceover work throughout the series. 10. 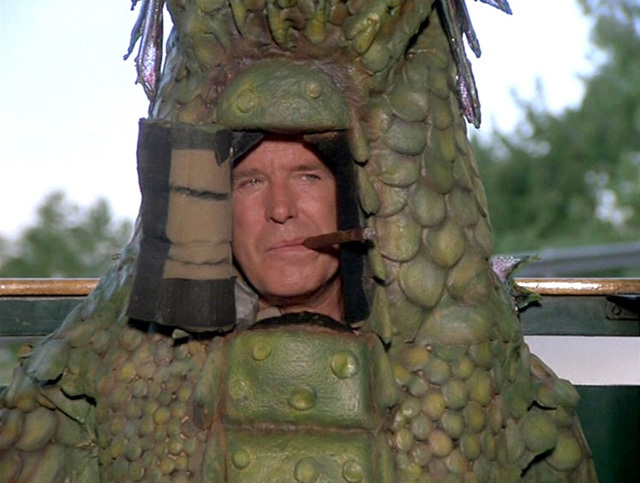 Dwight Schultz revealed that not long after The A-Team had premiered and proved to be a massive hit, George Peppard had an idea he pitched to producers. He decided that they should shoot the show's eventual finale in advance and have The A-Team on a mission where once the plan did not come together. Peppard suggested that all the other members of The A-Team should disappear one by one, and the final shot of the series should be on Hannibal, just like John Wayne's character of Davy Crockett in The Alamo. Nobody Peppard told the idea to liked it. As it was, by 1986 The A-Team was no longer the darling of the peacock network that it once was, and there was to be no blaze of glory finale as Peppard had hoped. The episode that was intended to be the series finale, The Grey Team, aired on December 30th that year. However, an error at NBC meant that the proposed penultimate episode, Without Reservations, went unaired. With no fanfare, NBC eventually broadcast it among a batch of reruns in March 1987. In it Murdock can be seen wearing a shirt with the words 'ALMOST FINI', whereas in The Grey Team his shirt reads 'FINI'.